HOUSTON – October 20, 2018 – Families, students, educators, and local industry leaders gathered at Sam Houston Park in downtown Houston this past Saturday for Houston’s Eighth Annual Energy Day Festival, hosted by the Consumer Energy Education Foundation (CEEF) along with its partner Consumer Energy Alliance (CEA). The free event – which is now the largest energy-focused festival in the nation — centers on celebrating the importance of science, technology, engineering and mathematics (STEM) education and their innovative impact on energy. 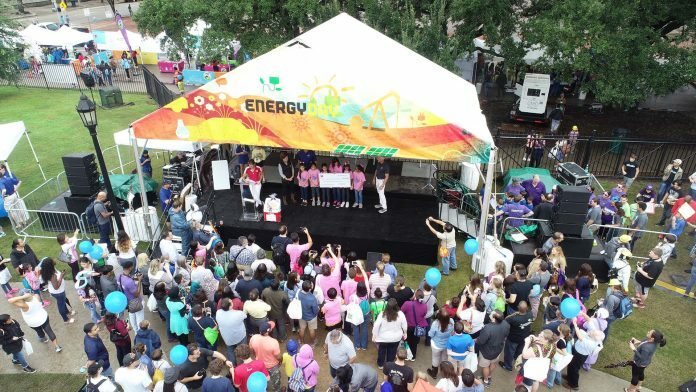 The Energy Day Festival featured more than 66 interactive exhibits and demonstrations, from several of Houston’s leading companies – including Caterpillar, Chevron, Conoco Phillips, Direct Energy, Golden Pass, Noble Energy, Phillips 66, TechnipFMC, Telemundo and TransCanada. Each exhibitor was on hand to greet, educate, and entertain what Houston Police Department estimated to be more than 25,000 people who attended despite the weather. From robots demonstrations by FIRSTRobotics and Microsoft to LEGO engineering and rocket-making, this year’s exhibitors showcased cutting-edge technology in an accessible format to students, as a way to excite the next generation about career opportunities in the energy industry. From January through October of this year, CEA and CEEF help host STEM-focused competitions in technology, computing, robotics and inventions such as SeaPerch, an innovative underwater robotics program that equips teachers and students with the resources they need to build an underwater Remotely Operated Vehicle (ROV). The SeaPerch Program provides students with the opportunity to learn about robotics, STEM and engineering concepts, problem-solving, teamwork, and technical applications. Other competitions include the All Earth Ecobot Challenge, The Science Engineering Fair of Houston, The Houston Affiliate NCWIT Aspiration in Computing Award, The CSTEM Challenge, The Young Inventors’ Showcase, The MATE Underwater Robotics Competition, The Energy Day Art, Essay & Media Contest, and The John Kingsley Kerver Educator Award. During the awards ceremony at Energy Day 2018, partners and sponsors awarded over $24,000 to 184 students and teachers in 11 categories. Since the Energy Day Academic Program (EDAP) began in 2011, CEEF and CEA have awarded nearly $130,000 to more than 800 K-12 students and teachers at the Energy Day Festival. For more information on the festival, visit energydayfestival.org/houston. Consumer Energy Education Foundation (CEEF) is a non-profit organization focused on developing educational support materials, activities, resources, and information about career opportunities in STEM and energy fields for educational organizations, various programs, and events nationally. CEEF works to support and engage in activities and programs that motivate, inspire and improve students understanding of the various career opportunities that are available to them if they follow a path to energy and STEM fields. Consumer Energy Alliance (CEA) brings together families, farmers, small businesses, distributors, producers and manufacturers to support America’s energy future. With more than 550,000 members nationwide, our mission is to help ensure stable prices and energy security for households across the country. We believe energy development is something that touches everyone in our nation, and thus it is necessary for all of us to actively engage in the conversation about how we develop our diverse energy resources and energy’s importance to the economy. Learn more at ConsumerEnergyAlliance.org.